Monday I'm departing on a road trip that I've been waiting for 2 months to kick off. 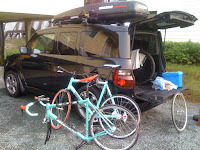 Shown here, packing up the car from my starting point of Surf City, NC. Aside from 'work', I'm hoping for some 'pleasure' in the form of riding the local trails, roads or the banks. The last one is up in the air. One of my dealers has invited me to the local Velodrome after our meeting in Asheville. Just so I don't regret my trip to the track, I threw the Pista Bars into the Rocketbox for a quick swap out.